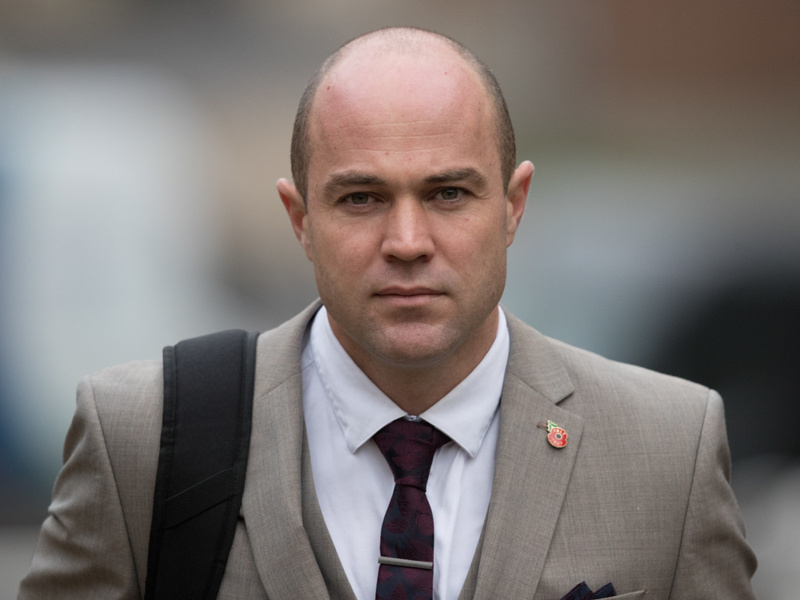 Emile Cilliers, 38, was sentenced to a minimum of 18 years in prison on two counts of attempted murder on Friday. At some point they were in love. At least it looks they were, in a photo that captures Emile Cilliers and his wife Victoria in a moment of joy; he's dressed in a tuxedo, bow tie and closed-mouthed smile. She is wearing a deep blue silk halter with dangling earrings that match. Her smile is broad and her arm is wrapped around his neck. A former British Army sergeant, Cilliers plotted not once but twice to kill his wife of four years so he could use life insurance money to pay off a slew of payday loans, then run off with the new Austrian girlfriend he'd met on Tinder. But his attempts were thwarted, and ultimately exposed, and on Friday he was sentenced to a minimum of 18 years on two charges of attempted murder. "The jury heard details of his coercive behavior towards his wife and his continued manipulation of all the women in his life to satisfy his own desires, whether financial or sexual," Prosecution Barrister Hannah Squire told reporters after the sentencing. "He showed complete and utter contempt for his wife, and this culminated in his desire to have her dead — whether that be to start a new life with his lover Stephanie Goller, benefit financially from the death of Victoria Cilliers or both." The first time he tried to kill his wife — the mother of two of his four children — was at home while the family was sleeping, according to the BBC. Cilliers opened the stove gas valve, hoping it would cause an explosion, then left the house to meet up with his ex-wife, with whom he was having an affair. But things didn't go as planned. When Victoria Cilliers awoke, she smelled the gas leak and jokingly texted him, "Are you trying to bump me off?" the BBC reported. About a week later Emile Cilliers tried again. This time, he thought he'd left nothing to chance. He suggested his wife, an experienced parachuting instructor, return to a favorite passion: skydiving. But not before he sabotaged her parachute. She jumped out of the plane at about 4,000 feet, and hurtled toward the Earth to what should have been her certain death. Except Victoria somehow managed to land in a soft, freshly plowed field, and survived. "I could not figure how to slow it down," she said, according to The Guardian. "It was just getting faster and faster and faster. The speed was unreal. The last thing I remember is trying to get some kind of control, then everything went black." She broke her pelvis, ribs and two vertebrae, ITV reported. The British Parachute Association launched a probe into the fall and discovered that both her main and reserve parachute had been tampered with. That's when the police began their own investigation, and Cilliers spending sprees, whirlwind romantic escapades and penchant for prostitutes came to light. Throughout the trial jurors heard details of Cilliers' outstanding debts to friends and payday loan companies, which came knocking on his door. He owed about £22,000, nearly $30,000, and could easily have paid it back with his wife's life insurance claim of £120,000 or almost $160,000. "That your wife recovered at all was miraculous; she undoubtedly suffered severe physical harm, and she must have suffered psychological harm in the terror of the fall and since," Justice Nigel Sweeney said after sentencing Cilliers on Friday, according to The Guardian. Sweeney called Emile Cilliers' murderous plots "wicked offending of extreme gravity." Meanwhile, Victoria Cilliers still processing the events of the past three years. "I've been through every emotion under the sun," she told ITV. " I've had plenty of time to think about things, which is probably why I'm not overtly angry, partly because I'm still in shock, slightly stunned about the whole thing. Also, I've got two young children. I'm the sole carer for them. I can't be angry, bitter, really emotional. I need to keep an even keel for them." She says she has no plans to divorce her husband, according to The Guardian. For the immediate future, Victoria said she intends to face Cilliers about what he did to her.